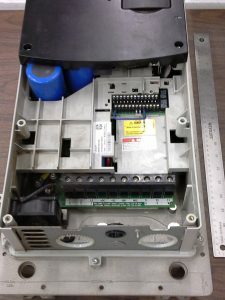 Blog > Repair Solutions From the Plant Floor: Allen Bradley Servo Drive Blows Up! Repair Solutions From the Plant Floor: Allen Bradley Servo Drive Blows Up! KABOOM! Rarely a good sound on the plant floor! What happened to this Allen Bradley Powerflex servo drive p/n 20AD065A0AYNANC0 to give our food industry plant customer a headache – literally!? Excessive current is the typical cause for damage like this to fuses in a drive. 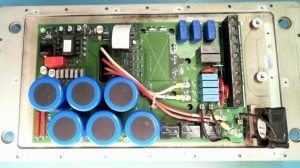 In this particular case, the bridge rectifier module was shorted resulting in extreme current and damage to the fuses and capacitor. Yow! Simultaneous violently exploding fuses and a capacitor! All kinds of bad news here at first glance – this drive needed replacement of the diode module, IGBT, capacitors and optocoupler. The good news is Allen Bradley servo drives are survivors! The disassembly, repair and cleaning, and reassembly was successful! This drive went right back into service in the plant. And, at a cost far less than the cost of a new unit and even about 40% less than a reconditioned unit.